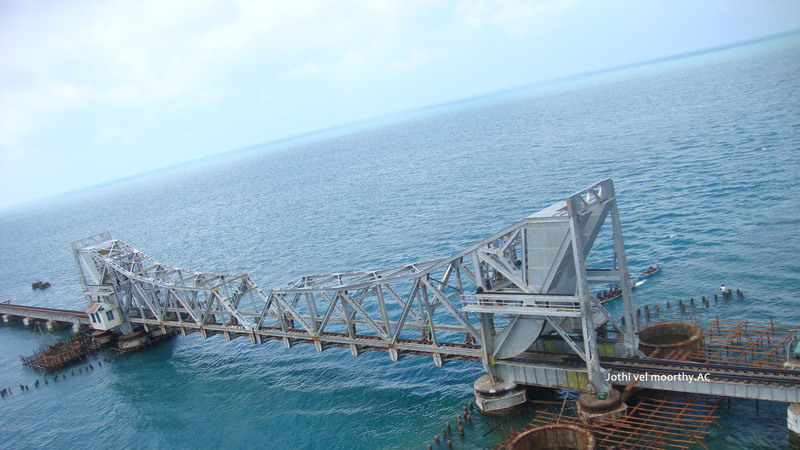 Pamban rail bridge, an engineering marvel and India’s first cantilever bridge was the only source of connectivity to the holy town Rameshwaram till the year 1988. The need for rail connectivity between the main land and the island was felt in the late 1870s, when the East India Company, expanding its trade, decided to establish rail link between Danushkodi and Colombo. After feasibility study, a proposal on “Indo-Ceylon project” was sent to the British Parliament for building a rail bridge from Mandapam to Pamban and from Danushkodi to Thalaimannar at an estimated cost of Rs.299 lakh. The British Parliament rejected the project, stating that the cost of the project was too high. It, however, gave its nod for the Pamban rail bridge at a cost Rs 70 lakh in 1880. Soon the excavation work began and the South Indian Railway commenced the bridge construction in 1902. The ‘Khurai” families from the Kutch region in Gujarat, who had experience in working with the Himalayan Railways were brought to Pamban for excavation and erection work, while the fabricated structures were brought from Britain. Work was smooth till the construction of 112th pier from Mandapam side. Bandra-Worli sea link was thrown open to traffic since 1914 and is still going strong, providing the much needed rail connectivity to Rameswaram. Located at the world’s second highly corrosive environment, the bridge was constructed amid challenges. Having survived the devastating 1964 cyclonic storm, the bridge crossed a century. The strength of the bridge was put to test for the first time in December 1964, when a severe cyclonic storm hit this part of the area. All the girders, both RCC and steel were washed away. Two of the 141 piers also damaged, but the Scherzer’s span withstood nature’s fury. This time, it was the turn of Indian engineers to show case their engineering prowess. A team of engineers, led by the then Assistant Engineer E Sreedharan (The Metro Man) salvaged the girders and put the bridge back on the rails in just five months. Sreedharan sir went on to work on the challenging Metro Railways and Konkan Railways Project a truly dedicated official who redefined the way public engineering projects were executed in India. The rail bridge threatened to become defunct, when the Indian Railways announced the Unigauge policy in 2006. The Railways considered a proposal to construct a new bridge, but gave up the idea as it would cost a whopping Rs.700 crore. Stepping in, the then President A.P.J.Abdul Kalam, who hailed from Rameswaram island, suggested that the existing bridge could be strengthened for gauge conversion. After obtaining expert opinions from IIT-Chennai and structural engineers, the bridge was strengthened to broad gauge standard and train services resumed in 2007.The bridge was further strengthened in 2009 for running of goods traffic. It suffered a jolt, when a barge, being taken through the channel, crashed into the bridge, damaging the 121th pier after anchor failure. After a week, train services were resumed in the bridge. Fighting to maintain the 2.06-km-long bridge with more than 140 spans and located in the world’s second highly corrosive environment, Southern Railway has now decided to try polymer alloy coating for girders on a trial measure to enhance the life of the girders.Three manufacturers had claimed that polymer alloy coating would not only enhance the life of the spans but also reduce the frequency of painting to once in 15 years. Now how the Railways and the Government work on this project is going to be very crucial. The bridge which is a marvel of modern engineering and an extremely popular tourist spot with tourists waiting to view the train passing over the bridge becoming a regular sight! Let us hope that the government introduces more measures to popularize Dhanushkodi, Rameshwaram and the Pamban Bridge!